The V-neck featuring a concave deck. Ever wondered why John John Florence surfs so good? The answer may well be under his feet. Shaper Jon Pyzel of Pyzel Surfboards has been shaping John John's boards since he was five and John John has been going from strength to strength with each new board Pyzel shapes for this young surfing superstar. Established in Hawaii in 1995, Pyzel Surfboards specialises in creating performance surfboards and works to improve the designs to suit all different levels of surfer. Pyzel surfboards is based in our factory on Oahu's North Shore, but Jon shapes around the world in California, Japan and Europe. This allows him to fine tune designs for all kinds of waves, from mild Euro waves to nuts Teahupo'o. Jon Pyzel make boards for everyone, from top-level pros to guys who just want to have a fun session down the street and everyone in between. "I love making people surfboards. There’s so many little different refinements you can make that make a huge difference in performance. When you see someone get a pretty crazy wave on one of your boards and you're like right on, that thing worked alright. That’s pretty rewarding, I love it". If you're interested in ordering a Pyzel surfboard, contact us for more information. The Rat Skull is a new design to perform in small wave conditions. It’s got a wide surface area for fast paddling and easy gliding through the flat sections. The bottom has little Vee in the nose, running into a double concave and solid Vee in the tail. The double concave provides heaps of speed, while the Vee will let the board surf very easy from rail to rail. The quad fin setup has proven a huge plus with this model allowing it to perform in small stuff right up to head high barrels. 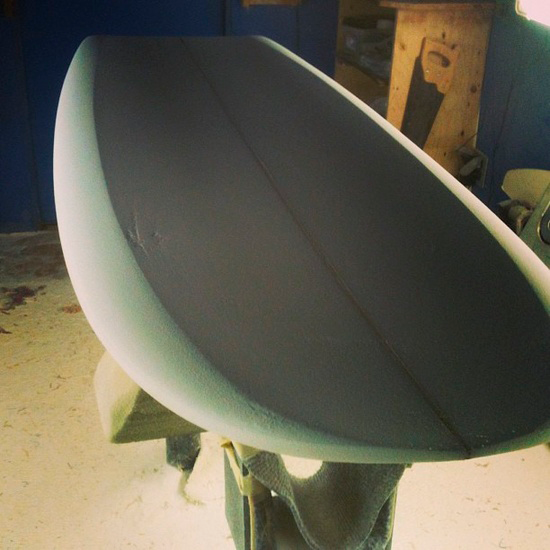 This board has an unique resin pigment to achieve a rich colouring and also features S-glass lamination to ensure you a high quality, light and strong surfboard. To buy this product, click below on 'ADD TO CART'.